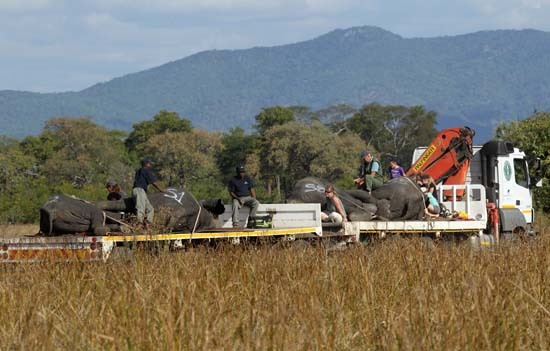 LIWONDE NATIONAL PARK, Malawi -- Half a dozen African elephants lay strewn on a riverside plain in Malawi, immobilized by darts fired from a helicopter in a massive project to move 500 elephants, by truck and crane, to a sanctuary for the threatened species. As development squeezes Africa's wildlife areas, this kind of man-made animal migration is increasingly seen as a conservation strategy in Malawi, one of the continent's most densely populated countries, and beyond. Conservationists flipped the prostrate elephants' large ears over their eyes to block out light, and propped open the tips of their trunks with twigs to ensure unimpeded breathing. 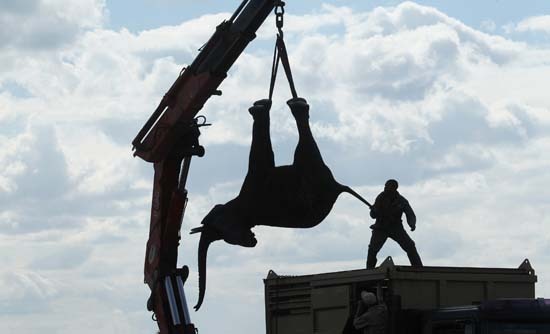 Then the multi-ton elephants, hanging upside down from ankle straps, were loaded by crane onto trucks for a road trip of about 185 miles (300 kilometers) to a safer, more spacious area. "This is very much the way that we'll have to manage things in the future," said Craig Reid, manager of Malawi's Liwonde National Park, which is run by African Parks, a non-profit group based in Johannesburg. Reid described Liwonde as "an ecological island in a sea of humanity." 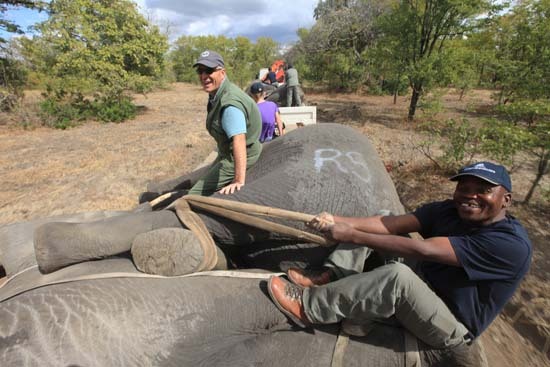 African Parks, which manages all three Malawian reserves, is moving the 500 elephants this month and next, and again next year when vehicles can maneuver on the rugged terrain during southern Africa's dry winter. The Dutch PostCode Lottery and the Washington-based Wyss Foundation are key funders of the $1.6 million relocation. An Associated Press team witnessed a day of catching elephants in Liwonde. Dr. Andre Uys, a wildlife veterinarian, rode in a helicopter that flushed elephant families from woods onto a floodplain, where he darted them in their hindquarters. Then capture teams in vehicles raced across the rutted earth toward the prone elephants' dark silhouettes. 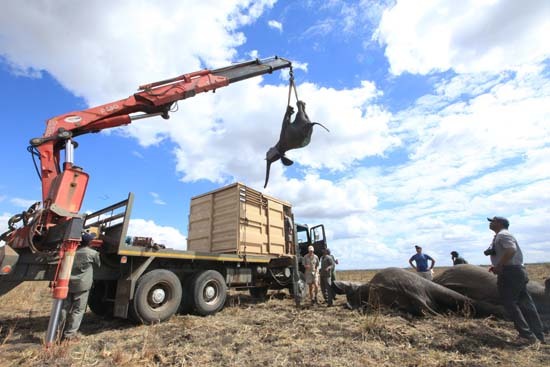 The immediate priority was to check the health of the elephants before they were hoisted, trunks dangling, onto flatbed trucks. Monitoring included the intimate act of placing a hand over an elephant's trunk to feel the hot blast of exhaled air every few seconds. 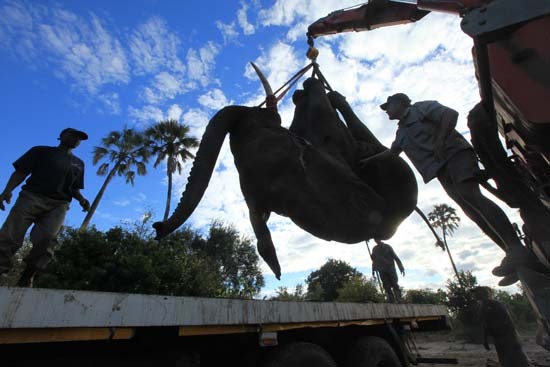 Teams rounded up 24 elephants, including a gargantuan bull, in a day's haul that they described as a record. In one case, an immobilized calf struggled to breathe, and conservationists funneled oxygen up a tube in its trunk and measured vital signs. Uys speculated that the calf had river water in its sinuses. "Those little guys actually can't walk along the bottom, they have to swim across the channels when we push them out into ground where we can catch them," he said. "In that process, with all the splashing from the mothers and everything, they get a lot of water up the nasal cavity." 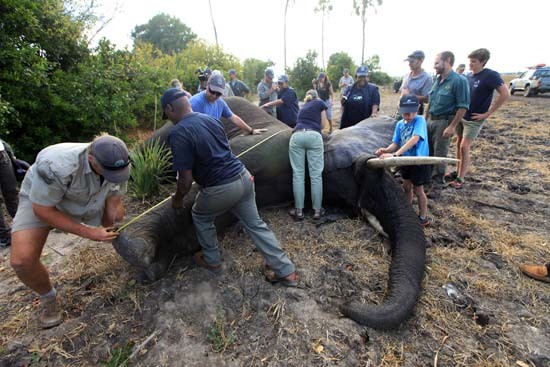 While disease transfer is a concern, species restocking in Mozambique's Gorongosa National Park and South Africa's Addo Elephant National Park has been successful, said George Wittemyer, an African elephant expert and associate professor at Colorado State University. "I see it as something that's here to stay, for better or worse," Wittemyer said.